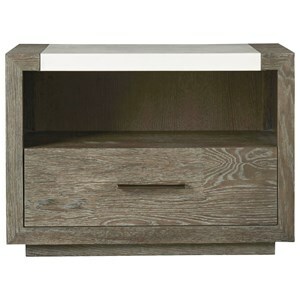 With a lightly distressed finish and simple storage, this nightstand is a staple for any bedroom. 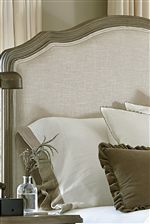 The Studio finish gives the piece a look equally suited for a contemporary living space or more traditional bedroom. 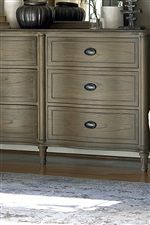 Fluted legs and a shaped top suggest cottage design, and two drawers ensure ample space for bedside necessities. Capture the look of casual sophistication with this chic nightstand. The Curated 2 Drawer Nightstand by Universal at Darvin Furniture in the Orland Park, Chicago, IL area. Product availability may vary. Contact us for the most current availability on this product. The Curated collection is a great option if you are looking for Transitional Transitional furniture in the Orland Park, Chicago, IL area. Browse other items in the Curated collection from Darvin Furniture in the Orland Park, Chicago, IL area.